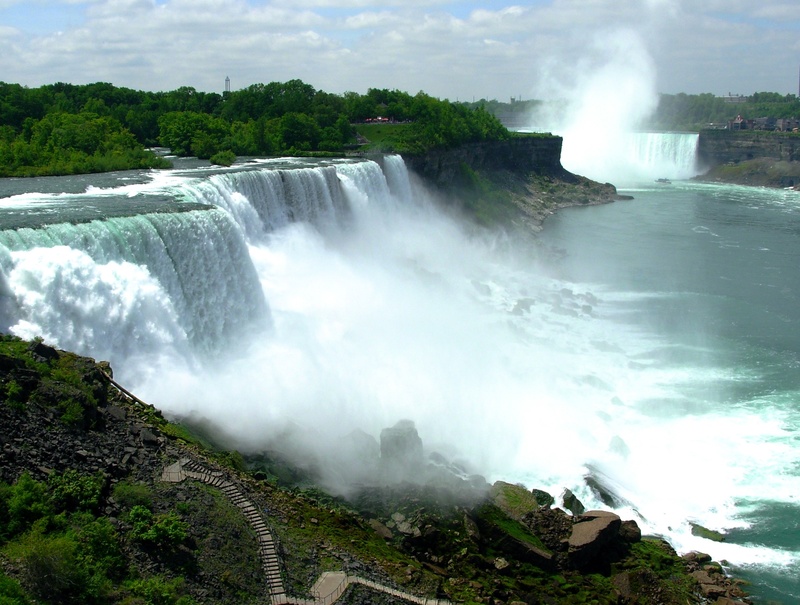 Niagara Falls is one of those places that can’t be adequately described; one has to be there, hear the roar and feel the mist to fully appreciate the magnitude and power. This site is among several places that were much more impressive in real life than I had expected them to be. I first saw the falls in 1976, when my college roommate was competing in the Miss USA pageant held nearby. As exciting as it was to be there for the live telecast, the most wonderful part of my trip was seeing the spectacular show nature stages at the falls 24 hours every day regardless of how many people are in attendance. What’s even more amazing is how many places all over the world are equally remarkable. It took me awhile (and some advice from Jeff) to decide which photo would go with this quote, since I’ve snapped so many photos of wondrous sights that took my breath away. Einstein said it well; even the most intelligent among us is duly humble in the face of creation. I wish for you many chances to thrill to such abundant natural magnificence, and vivid memories to treasure with awe and gratitude. May the Creator be pleased with what we offer in worship to Him, today. Amen to that. Such scenes always leave me feeling very grateful AND filled with wonder; a good frame of mind for worship. “spectacular show nature …….in attendance.” Loved that line. The place looks majestic. But I know I could never imbibe the whole beauty of the waterfall by merely looking at pictures or videos. The pictures of our trips thrill me as they recreate the ambiance for me while for others it’s just a lovely frame. Nature is too marvelous for any camera. I agree! I remember being very disappointed with our photos of the Grand Canyon; they just didn’t compare to the actual sight. But I have grown accustomed to the fact that two-dimensional images can’t replicate nature. As you say, they serve to bring back our memories which can fill in the gap somewhat. Thanks for being here! Thanks, Harshit — Einstein was a very brilliant man in more ways than one. I keep coming across interesting quotes from him. A lot of them are humorous, too. I appreciate your visits here! The older I get the more real that quote becomes. Thanks, Sheila. We did have a nice weekend; I just flew by, though! Time just seems to speed up more each day. I’ll have to look up the song by George Strait. I don’t know much about him except that a friend’s son was really crazy about him many years ago. I’ll keep the prayers going for you and Bill to have a good week also. Thanks for being here! Fabulous picture, Julia. Niagara Falls is incredible, and my friend who was dying of cancer insisted on going there, staring at the Falls for long periods of time. She never said what drew her there (from down in Tennessee), but I think it was the majesty of our Creator in contrast to how our lives are but drops of water in His whole scheme of things. I think of her whenever I see those majestic Falls. Thanks for the great quotation. Lanita, thanks for sharing the touching story about your friend. Jeff is from Tennessee too. I’m so glad you visited my blog! Thanks for your comments and I look forward to reading more from you and seeing you on FB too! Thanks so much – and speaking of inspiration, I really like your recent blog post about appreciation – I highly recommend it to readers! I appreciate your visits here. Absolutely lovely photo! And a quote that made me smile. Thank you for this one. I want to go see Niagra Falls! Kathy, it’s definitely worth the trip. Hope you get to go soon! They are pretty spectacular! You’ve captured them perfectly both in your photo and words. I just am stunned at the endless supply of fresh water that continues to flow. So much power. We didn’t stay in the town for lunch, it was a little bit like an amusement park when I was there years ago. But the falls are magnificent! I remember when I visited there in 1976, it was very much like an amusement park; I even have photos of my friend and me on a merry-go-round then. It seemed different a couple of years ago, more like a park with gardens. I don’t know if they have re-done it or if I just missed something that was there, but it was beautiful and the falls are stunning. Hey, they must have wised up and gone with the natural beauty instead of carnival thing. Good for them! My cousin lives in Ottawa. I hope to visit one of these days, maybe well swing by Niagra. It’d be way out of the way though. Yes, I think they must have re-configured everything. The gardens were lovely; probably I’ll be posting some photos here eventually.